The secant method is one of the most popular methods for root finding. Standard text books in numerical analysis state that the secant method is super linear: the rate of convergence is set by the gold number. Never- theless, this property holds only for simple roots. If the multiplicity of the root is larger than one, the convergence of the secant method becomes linear. This communication includes a detailed analysis of the secant method when it is used to approximate multiple roots. Thus, a proof of the linear convergence is shown. Moreover, the values of the corresponding asymptotic convergence factors are determined and are found to be also related with the golden ratio. Díez, P. A note on the convergence of the secant method for simple and multiple roots. 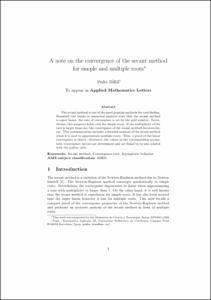 "Applied mathematics letters", Novembre 2003, vol. 16, núm. 8, p. 1211-1215.